What’s The Big Deal About The “Big Why” Anyway? Big whys are the propellant within big dreams. They provide one of the key ingredients to doing whatever it takes in the face of challenges to achieve your goals and dreams. Without the “why” the goal or dream feels empty, and leads to giving up. My big dream was the Ironman WC and my why within it was to help others achieve their potential in life and business. I knew that by pushing and expanding myself through that epic journey and accomplishment, I would be able to fulfill my big why. And it pushed me through, what appeared to be, insurmountable challenges. It works the same way for all of us, which is the reason for all the discussion around a Big Why. Step 1: IDENTIFY your dream and big why within it. In Business: If your big dream is to lead a $100M business, what is the why within it? Could be to provide big opportunities to your team members so they can lead big lives. Or could it be to enhance the lives of everyone in the world through your product or service? Or could be to provide your kids an ivy league life or fund your retirement? Perhaps it’s a personal dream like mine was. Don’t discount it because it doesn’t appear to be connected with your business or what puts food on the table. I didn’t think Ironman had anything to do with business and found out that it was the key to achieving everything I desired in my business and life. Whatever the big why is within your dream, identify it. Step 2: VISUALIZE what achieving your big dream will look, sound and feel like. Step into that reality on a consistent basis, put it on a vision board, carry it with you so you see it everywhere. It’s through this second step that our big why becomes our identity. We see ourselves as our big why fulfilled and unleashes our unconscious mind to fulfill it. Step 3: DO WHATEVER it takes to achieve it. My Big Why empowered me to do everything it took to achieve my dream. I had achieved goals and dreams before, but this was markedly different. This was a much bigger dream with further reaching implications for myself and others, and felt like so much more at stake. Like my very being was on the line (identity from Step 2). Because of this, I was propelled to do whatever it took, barring nothing, to achieve it. I was infused with daily laser focus on what was required to string together each milestone to deliver the promise of realizing my dream. This laser focus was a perspective of “how can I get this done” instead of “I don’t know if I’m going to be able to do this.” This is significant because when you have the perspective of seeing something only as a challenge for which there is a solution you can find, you find it more quickly and easily and then execute, and repeat in the next challenge. This is the process of achievement. By contrast, when you have the perspective of questioning capability, you get stuck there, and give up on your dream entirely. This is a dangerous place because once you give up here, you will give up everywhere. This is the process of non-achievement. Summing up, the reason these three steps of using your Big Why works, is because they tap into the power of your unconscious mind, which is where all learning, growth and change happen. The power of the unconscious mind is scientifically proven to work for everyone. How ‘bout giving it a try? Share with me what you discover. Oh, and one other thing; do this for yourself, and then help your team members do it. It will help all of you achieve goals with more velocity and ease. P.S. 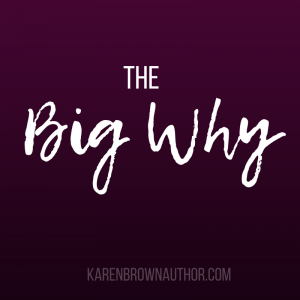 – Sometimes I get the question, “How can I find my why if I don’t know it?” Watch for a future blog article on this, or get in touch with me and we will find it.